Mother’s Day with the Cows! First of all Thank YOU so much for your interest in FocalHeart and special Thank You to all the persons who have taken the time to suscribe to the newsletter – It means a lot to me! 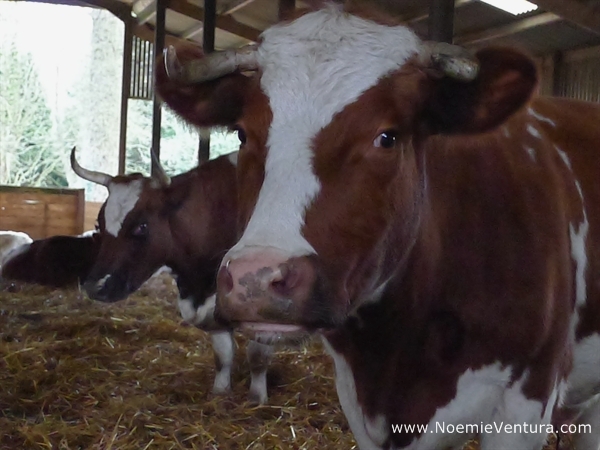 This Sunday I’ll be celebrating Mother’s Day with my very dear friends the cows, as I’ll be facilitating an Animal communication workshop with them. All dairy cows are mothers and they need to be recognised and celebrated as such! In India cows are considered sacred as they are referred to as the “Mothers of India”. The workshop is 6 hours long, broken into 3 sunday afternoons (from 2pm onwards) starting this coming Sunday and then on the 24th March and 07th of April 2013. It will take place in a biodynamic dairy farm in East Sussex (I’ll email you the details once you have booked). There are a few spaces left (not that many though, so if you are interested in joining us you will need to book promptly). We will finish at around 4pm, everyone is more than welcome to stay around and chat with the farmer during the evening milking (from 4h15pm onwards). The farmer will be with us all afternoon as he is very keen on animal communication. This week, we will be doing a few simple guided meditations/ breathing techniques and then we will be getting on with simple exercises to start communicating with the cows on a heart to heart level. The attendees will get to explore how they receive messages from the cows (feelings, voices/sounds, images, all at once?). We will be sitting in the barn, with the cows and calves. It’s absolutely safe but I thought I should mention it. During the last afternoon we might go and connect with other animals on the farm depending on the interests of the group. The workshop is over 3 sunday afternoons so that the attendees get the time to practice or just reflect on what has been said during the workshop. The price is: £50 per adult and £35 per child (7 years old onwards) for the whole workshop. I need to know in avance how many people will be there, so please do let me know if you are coming! Some of the money will go towards creating something nice for the cows. – Anna Fraser, Scientific Officer within the Farm Animals Department at the RSPCA.